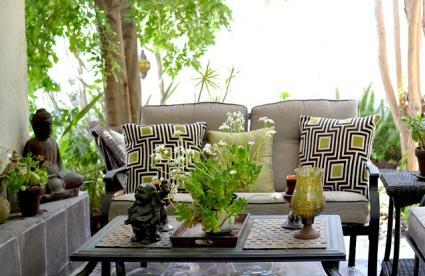 Patio gardens are perennially trendy because they are small and easy to enjoy as an extension of the house. There are many ways to create a patio garden using sustainable materials and landscaping techniques so it, too, can be an extension of a green home. 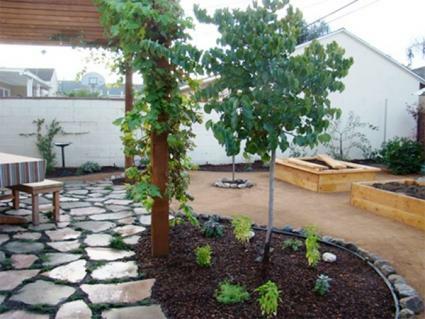 A sustainable patio garden should feel like your own personal paradise. 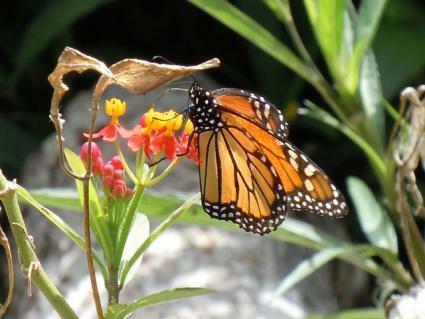 In keeping with the principles of sustainability, the process of creating it should not cause harm to other living things or prevent future generations from enjoying the Earth's abundant resources. The first choice in materials for a sustainable patio garden are those that are recycled - in this way you are avoiding the issues associated with the extraction of raw materials and the industries that process them into landscaping products. 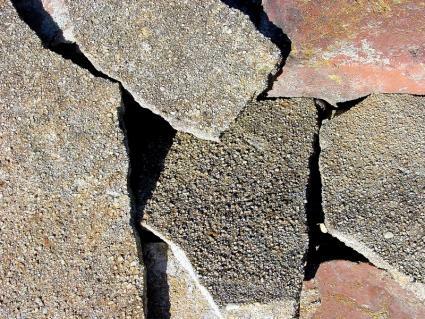 Broken concrete - often referred to as urbanite - may be obtained from construction sites where someone is demolishing a driveway or patio. These pieces can be recycled to use like large flagstone pavers for your patio, as well as blocks for retaining walls or borders to hold back the soil along the edge of the patio. Reclaimed lumber - from old barns, pallets, construction sites or wherever you can find it - is useful for repurposing as planters, trellises, arbors, pergolas and other structures that may be useful in a patio design. Upcycled accessories might include an old bath tub or horse trough repurposed as a water garden; bird feeders made from recycled bottles and cans; or art pieces made from old farm implements. After all recycled options are exhausted, there are plenty of sustainably produced patio materials on the market, from recycled plastic decking to furniture made with FSC-certified lumber. No matter what your patio design is, there is a probably a green alternative for any materials required to build it. 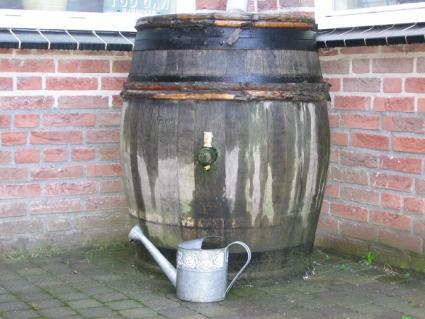 Catch the rainwater coming off the roof at the edge of the patio in a rain barrel and use it to water the patio plantings. Use a permeable surface that allows the water to trickle through rather than run off into a drain. Flagstone, urbanite, or concrete pavers with gravel or soil filled spaces between them allows the water to seep into the soil, while poured concrete surfaces do not. Use shade structures over the patio to create a cooler microclimate, allowing you to enjoy your patio more in summer, as well as to cut down on how hard your air conditioner has to work to cool the house. Just like designing any other patio, there is no limit to the possibilities for creative design when it comes to a green patio. Consider going with a theme to help create the design. In this patio a large pergola structure shades an area paved with urbanite as an alternative to flagstone. The outlying areas include raised beds for food production, a bird bath to attract wildlife, and various edible shrubs and trees, all with a porous groundcover of crushed stone that absorbs run-off. The shaded zone is a cool summer refuge created with a grape vine over the pergola - in the winter the vine loses its leaves to let the warmth through. Note the groundcover planted in the cracks of the urbanite to soften up the appearance and make it feel a bit greener. (c) b sq. Design Studio Inc.
Pallets are a largely considered a waste product, but have tremendous potential for re-use in the landscape. This garden shows how they can be stacked and arranged in various ways to create planters of different shapes and sizes, a pergola, trellises, and even an outdoor bar. Robert Boltman, landscape architect for b sq. 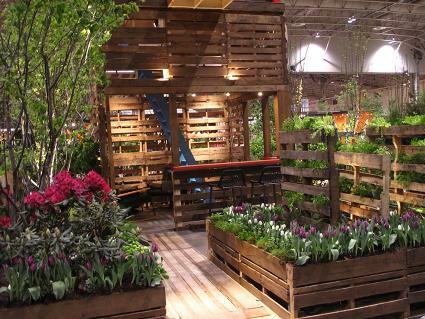 Design Studio Inc., said that "we predominantly used full pallets throughout the garden. We used the same size pallets for different sections of the garden making it easier to assemble. " Boltman added, "The goal was to utilize the pallets as they are and use their unique consistent size to create a garden." There are many ways to design a patio, but make the extra effort to do it in a way that supports the environment, rather than depleting it. Aesthetically, the results can be just as stunning, but there is an additional satisfaction in working with nature in the process.